So I grew up in Indiana and when I think of Indiana I don’t think of running. 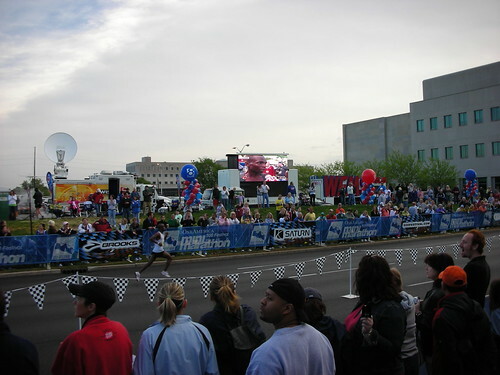 Turns out they have the largest half marathon in the country. 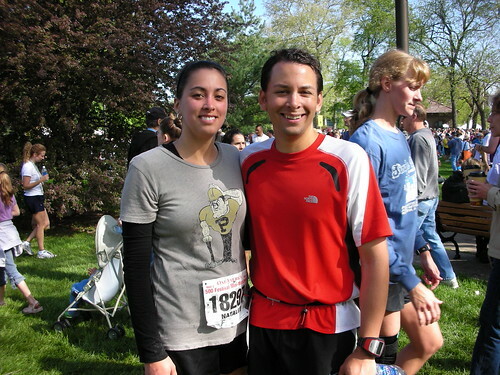 With my sister living in Indianapolis only 20 minutes from the start line, it seemed like a great race to travel to. Prior to the Napa Marathon, I have run all my races solo. I benefited in that race by having Glenn pace me and I enjoyed the experience. So to give back, I decided to pace my sister on this race as she wanted to break the big 2 hour barrier for a half. No problem? We strategized the night before and that is when I learned that her training program involved some short runs and not drinking all week leading up to the race. Oops. It rained hard all night long so I was sure we would wake up with wet weather but it wasn’t. 60 degrees and a bit humid. Not too bad. We got in our corral and waited for the start. This is probably the best part of the race because they have corral A-Z and you get seeded up higher the faster you are. I was in C. They put a big letter on your bib so you feel speedy. 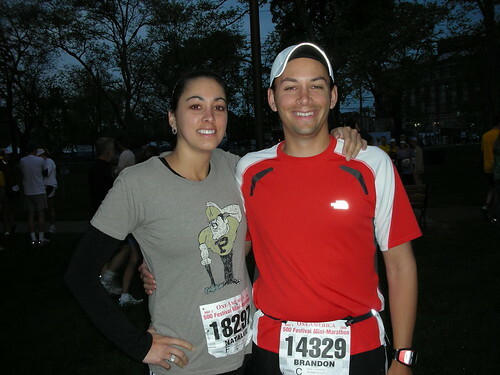 However, I went back with Natalee in the F corral so we could run together. The race started out quickly and we were on the move. They have so many bands playing along the route that I lost count. You would literally be hearing 2 songs at once most of the time as you transitioned from one band to the next. Some sucked. Some were good. One played Metallica decently. It made up for the lack of headphones. It was kind of like American Idol as you went. We kept charging out to the speedway. You hit it around mile 6. We entered on the south side and went through the tunnel and out on to the track. The surface seems more bouncy than the city streets. The crowd tended to slow down as they took in the track. The back stretch wasn’t too interesting except that men with whistles would kill you if you stepped onto the grass. As we rounded turn 4 and went up the front stretch, you can feel the drama. The pagoda in sight…then you reach the start/finish line which is a row of bricks from the original track surface. Natalee and I threw our bodies into push-up position and did the traditional single push-up and locked lips with the bricks. This is just what you do here. Don’t ask questions. Then we popped up and motored on around and out of the track. Leaving the track, the route gets pretty ziggy. With all these people, you don’t get a lot of room to run the optimal tangent but we did our best. At mile 10, I started counting it down to Natalee and she seemed to keep picking up the pace a few seconds a mile. Its a nice long stretch for the last mile in. You can see the finish the whole way in. We brought the pace way down and I saw that she was in good shape for the finish. I made a comment that she nailed her goal and she responded with the a “I am NOT done yet”. Ok…so I decided to sprint to the finish and let her have her moment. Looking at the results, I finished 30 seconds in front of Natalee and passed over 100 people. Thick tired crowds are fun. No picture of me finishing but here was the winner (I think) courtesy of my Mom. We got our medals and met up with my parents shortly there after. In truth, I was more excited to visit the Porta-Potty — my first half without a pit stop! Yeah for me. Check out the map. Its not often you get a major landmark on a run that is visible from satellite. You can clearly see the track and our speedy jaunt around it. That’s about it from here. Excited to come take part in this and see my sister get a PR. 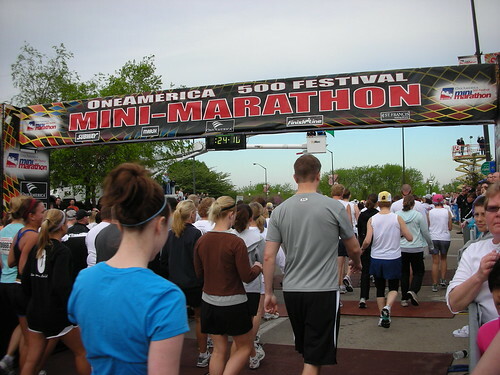 Also excited to see lots of runners in Indiana. This seems like an event that is growing in popularity in a state that isn’t known for its health.